In my first blog for LHSA I talked about the journey from my time there as a student to my current role as a trainee. In this follow-up piece I will cover some of the exciting opportunities and valuable experience which my time here has provided me with. Firstly, I would like to thank the LHSA team for having made me feel so welcome during the time which I have spent here so far. From allowing me to take part in the weekly team meetings to involving me in the renewal accreditation process (of which I will speak a little more of later in this blog) I truly have felt like an equal member of the team from the outset. Something which I feel that the CRC as a whole excels at and I know that everyone I have spoken to who has worked there, both past and present, feels the same. Secondly, I would like to apologise in advance if this blog seems a little dryer than the last. The reason for my literate paranoia is that one of my duties as a Skills for the Future trainee is to keep a monthly learning log listing what I have been doing, experience gained and how I will put this into practice. It sometimes feels like I am making a hand-list of my own activities, which indeed I am, I guess, for future reference an ease of access. However, I promise to try my hardest not to fall into log mode and put you into sleep mode! One of my main duties at LHSA has been working on the Norman Dott project cataloguing his case notes. I won’t go into great detail here about his ground breaking neurological work in Scotland and other elements of his distinguished career as this has been covered in other blogs. For me, however, it has given me the opportunity to work with LHSA’s unique methodology of cataloguing case notes using Encoded Archival Description (EAD), made me more experienced in writing XML and helped me to understand of the issues and precautions which must be considered when cataloguing more sensitive archives. Another benefit of this has been the massive boost to my medical knowledge and vocabulary as well as discovering some rather unusual conditions such as clawfoot and Paget’s disease (the former I had the pleasure of googling just before lunch). Some of the human stories to be found within the collection are fascinating and at times deeply moving: even when trying to remain objective and professional it would take a heart of stone not to be touched by them. There have also been some rather “out-there” cases, such as the travelling businessman who suffered from sore feet the moment he arrived back in Edinburgh yet was effected by this in no other place which he visited – one wonders if there was another reason behind this, of which I will say no more! Overall, I feel highly privileged to have played a small role in this project and I feel that it will make a great addition to my CV. I have also had the good fortune to receive conservation training for half a day each week with the very talented Emily Hick, whose work on LHSA's HIV/AIDS collections has been a real eye-opener for me in terms of developing new ways of housing and preserving non-traditional archival materials - from condoms to watches. My duties have been a bit less creative, but have introduced me to the fundamentals of surface cleaning and rehousing materials in preparation for long term preservation within the archive. I have also removed more staples in the last two months than I have in my entire life – and the strange thing is that I find this very therapeutic! Lastly, as mentioned above, I have been trusted enough to be involved in LHSA’s accreditation renewal process for which I feel truly honoured. Not only has this introduced me to the Archive Service Accreditation Standard and its benefits, it has also allowed me to develop my knowledge of how an archive is managed from the top to the bottom, from the store to the search-room and everything in-between. I have enjoyed being a part of this so much that I have asked to continue working on it even after my time at LHSA comes to an end. So to wrap up I would like to thank Ruth, who had the idea to include me after I showed an interest in the accreditation process, and Louise for all her help and advice. In my last blog, I wrote about the deterioration of X-rays in the LHSA collections. This week, I will talk about how we intend to store them to slow down the rate of degradation. The best way to store X-rays, and most photographic material, is to freeze them. Chemical reactions increase as the temperature rises, and colder conditions slow them down. So, by placing the X-rays in to temperatures lower than 0°C, the rate of deterioration will decrease. A conventional freezer can be used to freeze small collections, but the items need to be properly packaged first to avoid any moisture coming into contact with film. We have decided to use a method recommended by the National Park Service, which uses two barrier layers to protect the photographic material. First the X-rays, which are already packed into inert plastic packages and labelled according to their reference number, will be placed into an archival box. Any empty space in the box will be filled with layers of conservation grade mount board and acid free tissue paper to help absorb any moisture inside the package. The box will then be inserted into a tube of Marvelseal® (an aluminised polyethylene and nylon barrier film which resists the transmission of water vapour and other atmospheric gases), and sealed with a strong tape. A humidity indicator will be attached to the outside of this package, so that any moisture ingress can be easily spotted. This package will then be inserted into a polythene bag which is again sealed with a strong tape. The box is then clearly labelled with its contents and placed into the freezer. A map of the contents in the freezer will also be made, so that the X-rays will be easy to find when needed. If the X-rays need to be consulted at any point they can be removed from freezer, but will need to be slowly acclimatised to the warmer temperature, to avoid the formation of condensation on the film. To do this the X-rays can be placed into a study box and left in a stable environment overnight to gradually adjust to the new temperature. This new storage method will increase the lifetime of the X-rays significantly. I hope you think of them next time you open the freezer door! Have a look at the Media Storage Guide by the Image Permanence Institute for more information on the storage of photographic materials. This week’s blog about our Wellcome Trust funded projects comes from Project Cataloguing Archivist, Clair. 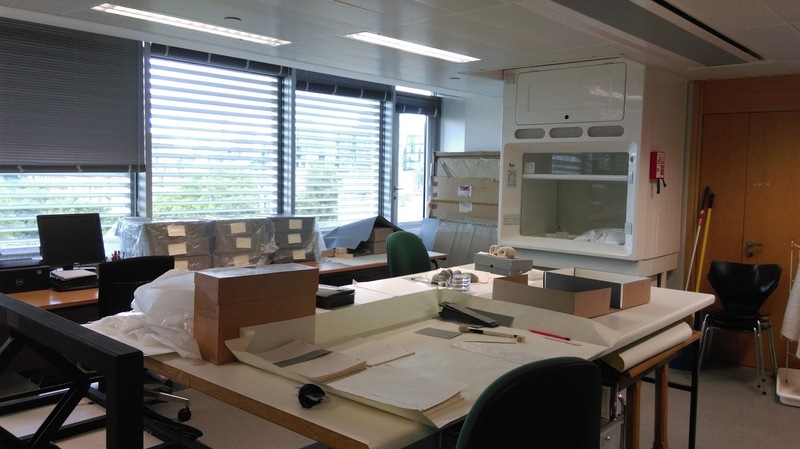 As we welcome our new Project Cataloguing Archivist, Rebecca, to LHSA to start on our next Wellcome Trust (WT) funded project, in this week’s blog I wanted to reflect on all of LHSA’s collections that have benefited from the Wellcome Trust Research Resources awards thus far. The Wellcome Trust offer support through these grants to repositories that hold significant primary source collections within the interdisciplinary field of medical humanities and social sciences. Naturally the rich variety of medical related records that we hold at LHSA can greatly benefit from these awards, which have enabled us to catalogue and preserve collections that hold huge research potential to the scholarly community and beyond. Whilst working as Project Cataloguing Archivist I have been lucky enough to work on two of LHSA’s WT funded projects, including cataloguing Norman Dott’s neurosurgical case notes and cataloguing our UNESCO-awarded HIV/AIDS collections. Just last week I also got a taster for the project that Rebecca will be working on to catalogue LHSA’s TB and diseases of the chest cases notes and registers. · Case notes of University of Edinburgh clinical professors: Edwin Bramwell and Norman Dott. · Case notes of University of Edinburgh clinical professors: James Learmonth and Derrick Dunlop. · Case notes of the Royal Edinburgh Hospital. · Edinburgh's reproductive and sexual health case notes. · Edinburgh's case notes relating to tuberculosis and World War Two injuries. From a cataloguing perspective it has not only been a luxury working with collections that have already gone through conservation treatment, but it is also integral to the output of cataloguing large collections. For example, case notes that have already been surface-cleaned and had staples and paper clips removed, as well as being re-housed in custom-made acid-free folders, means that the process of cataloguing at item level can be done at a faster rate – the quicker the output the quicker the collections can be used by our researchers. Preserving these twentieth-century folder-based clinical case notes has enabled LHSA to open up scarce resources with unique insights into many medical specialisms and historically important medical pioneers. This project-based funding has also facilitated the development of methodologies and built on experience that has contributed towards quality catalogues and conservation techniques that can be shared widely. 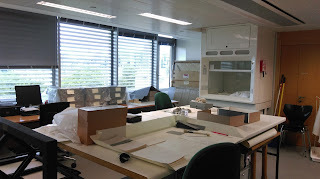 Over my time with LHSA, and within the University’s Centre for Research Collections, I have been struck by the transparency between various different projects and skill sets. There is a willingness to share information on best practice and adaptable methodologies, with advice being disseminated though publications and presentations. · Cataloguing Norman Dott’s neurosurgical case notes (1920 – 1960). · Policies, Postcards and Prophylactics: a project to catalogue and conserve LHSA’s UNESCO-awarded HIV/AIDS collections(1983-2010). 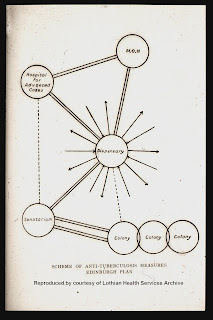 Attached to this project WT funding also supported a one-day symposium entitled "Conserving Condoms: Modern Materials in Medical Archives" and a public engagement project with the creation of our online educational resource (link). · RVH v TB: a project to catalogue LHSA’s Royal Victoria Hospital Tuberculosis and Diseases of the Chest Case Notes and Registers (c.1920 – 2000). · Towards Dolly: Edinburgh, Roslin and the Birth of Modern Genetics, based at the University of Edinburgh (UoE). Attached to this project an exciting exhibition has opened at the UoE Main Library 'Towards Dolly: a century of animal genetics in Edinburgh' with a chance to see Dolly the sheep on display! 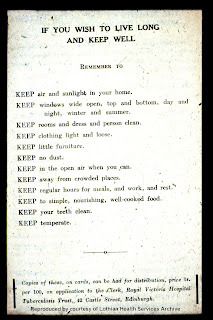 · Care Not Confinement: cataloguing and preserving the Archives of the Crichton Royal Hospital, based at Dumfries and Galloway Archive Centre. 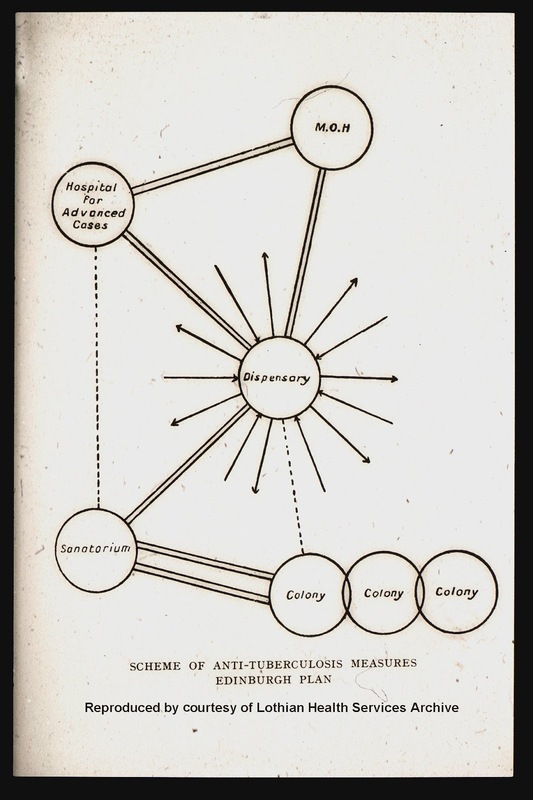 · A Catalogue of Rare Syphilis Books, based at the University of Glasgow. · Cataloguing and Preservation of the HIV/AIDS Collections of the London School of Hygiene and Tropical Medicine. 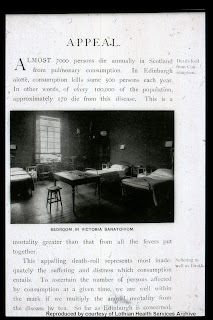 The Royal Victoria Hospital was a cornerstone of the Edinburgh Scheme, which I will describe in more detail in a future post, but essentially it was the first point of contact for people with tuberculosis to receive treatment and advice on preventing the spread of the disease to others throughout the first half of the twentieth century. These records also cover the period of mass X-ray screening in the 1950-1960s, which was an important way to identify and treat diseases of the chest. These records are a valuable source of information for researchers, covering several important developments in the history of treating tuberculosis in Edinburgh, and by cataloguing these case notes we will be able to support researchers who wish to study this area. I’ve only been here for a few days, but I’ve already managed to squeeze in a bit of time to take a quick look at the records, in between meeting my new colleagues and trying not to get lost in the corridors! 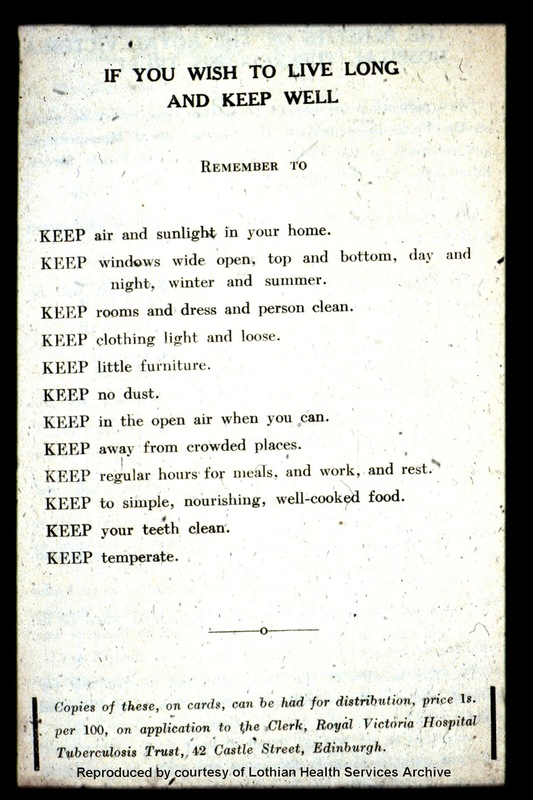 I’ve come to the project with a slight advantage, as my last post was working on a project at the Royal London Hospital Archives called “The Fight Against Tuberculosis” (here’s the blog I wrote for that project). I’m therefore already familiar with the basic information needed before tackling a project like this, such as the history of treatment and the significance of particular details, as well as the terminology and abbreviations which can be so intimidating when approaching medical archives from a non-medical background. From what I’ve seen so far, the records provide a great insight into several aspects of tuberculosis treatment, and I’m looking forward to properly getting my teeth into cataloguing them.